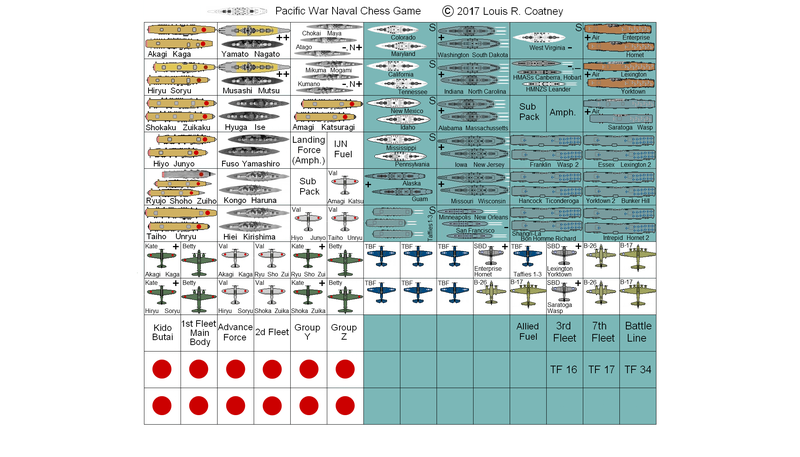 An individual is free to make one personal copy of Pacific War Naval Chess Game for his/her own personal use. C. my children Rebecca, Robert, Rohan, and Johanna, in the hope they will never have to go through a world war. For anyone interested in the naval and air war in the Pacific in World War 2, I strongly recommend you watch the videos Battle of Santa Cruz (CG Documentary) and USS Enterprise Battle 360. Rules in Rich Text Format - Use WordPad. Revised 16Apr19. Rules in Word format Revised 16Apr19. 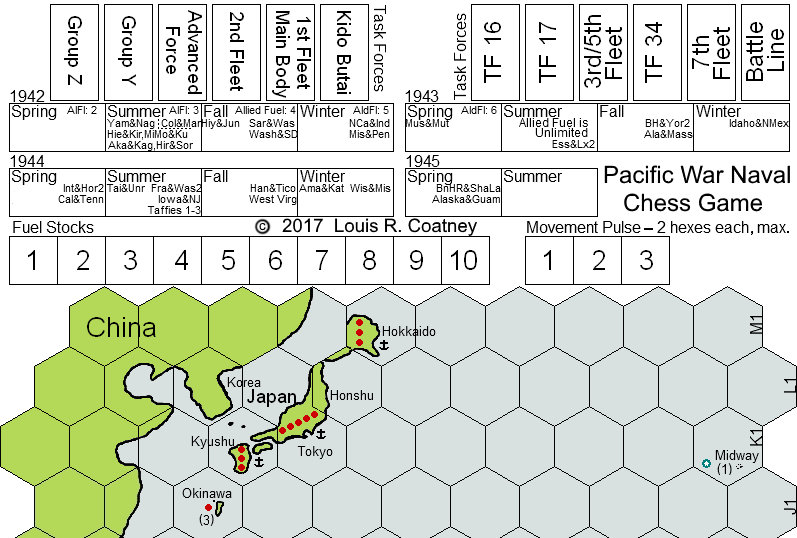 Pacific War Naval Chess Game mapsheet. Print this off onto an 11x17/A3 size sheet. Revised 10May17 - Allied insignia by our bases. Revised 14Apr19. 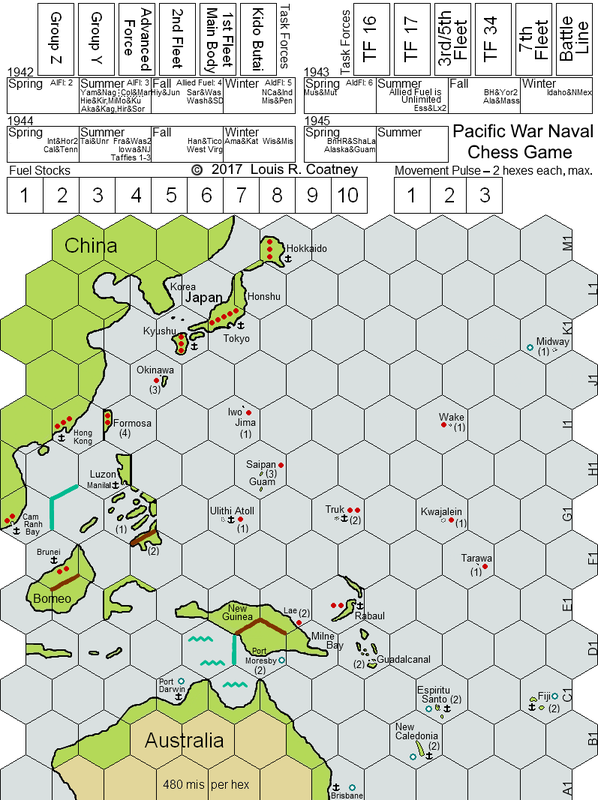 Pacific War Naval Chess Game mapsheet - northern half. Print this off onto an 11x17/A3 size sheet for a larger map. Revised 14Apr19. 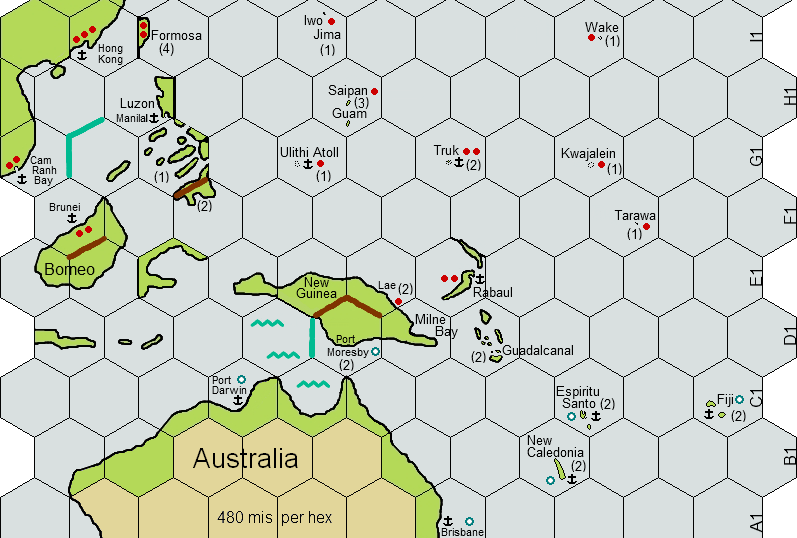 Pacific War Naval Chess Game mapsheet - southern half. Print this off onto an 11x17/A3 size sheet for a larger map. Revised 14Apr19. 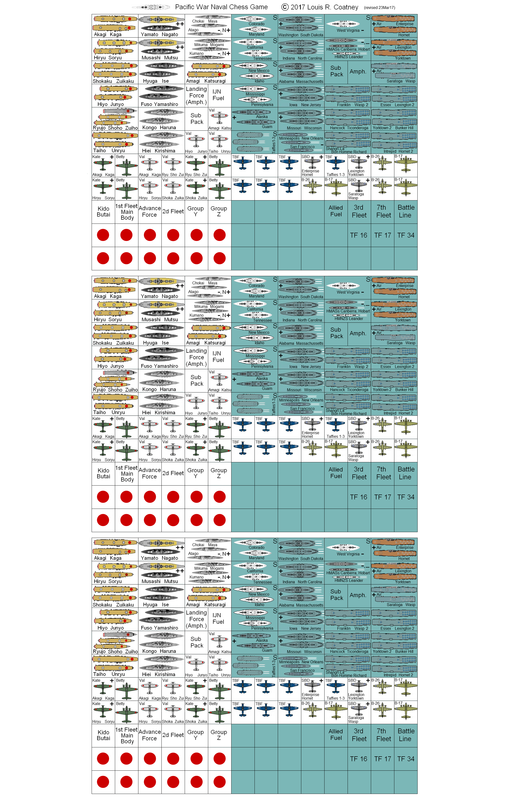 Pacific War Naval Chess Game units. Print off onto an 8.5x11/A4 size sheet. Revised 23Mar17. 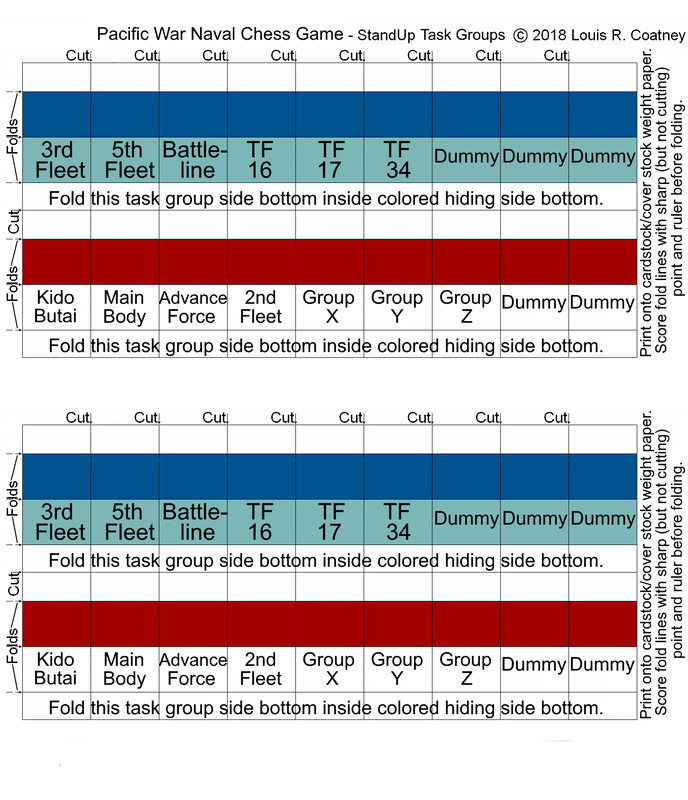 Pacific War Naval Chess Game standup task force markers. Print off onto an 8.5x11/A4 size sheet of cardstock. Revised 14Apr19. Pacific War Naval Chess Game units. Print off onto an 8.5x11/A4 size sheet. Revised 23Mar17. Makes smaller units better able to fit map. 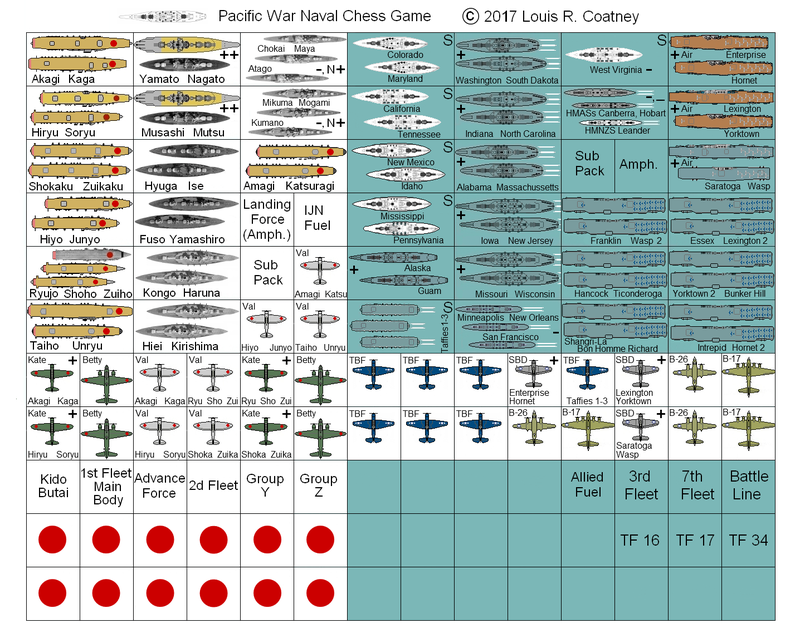 Pacific War Naval Chess Game units. Print off onto an 8.5x11/A4 size sheet. Revised 23Mar17. Makes more smaller units better able to fit map, for 11x17/A3 paper size. 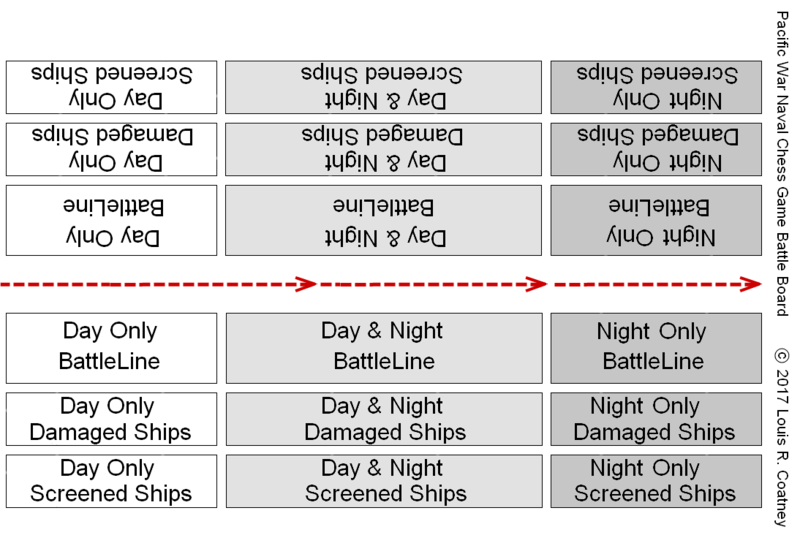 Pacific War Naval Chess Game Tactical BattleBoard. 8.5x11/A4 Revised 16Apr19.